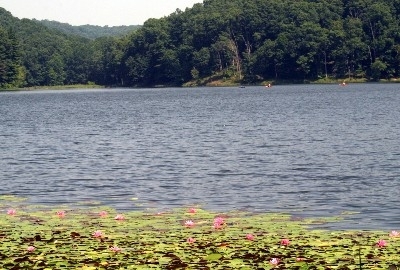 A natural paradise, Lake Hope State Park lies entirely within the 18,200-acre Zaleski State Forest in the valley of Big Sandy Run. It is a rugged, heavily forested region traversed by steep gorges and narrow ridges. 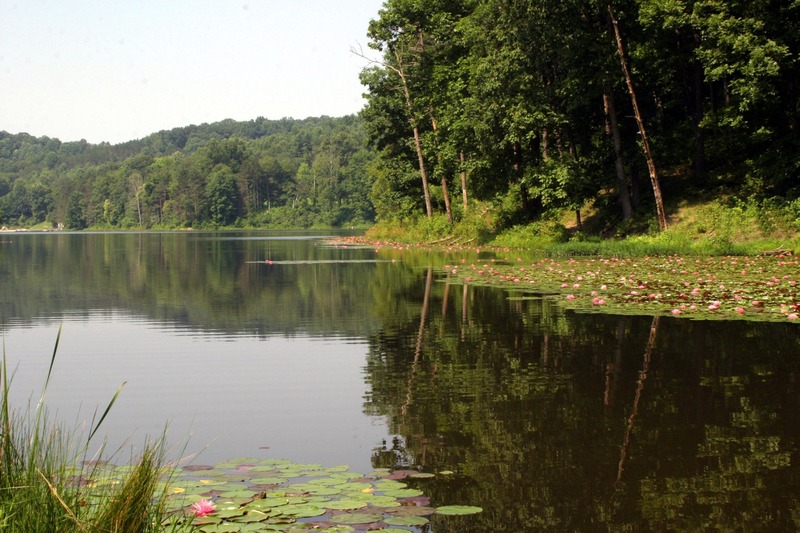 Abandoned mines, ancient mounds and beautiful scenery provide interest and pleasure for hikers, photographers, nature lovers and historians alike at one of Ohio's most historic and scenic state parks. 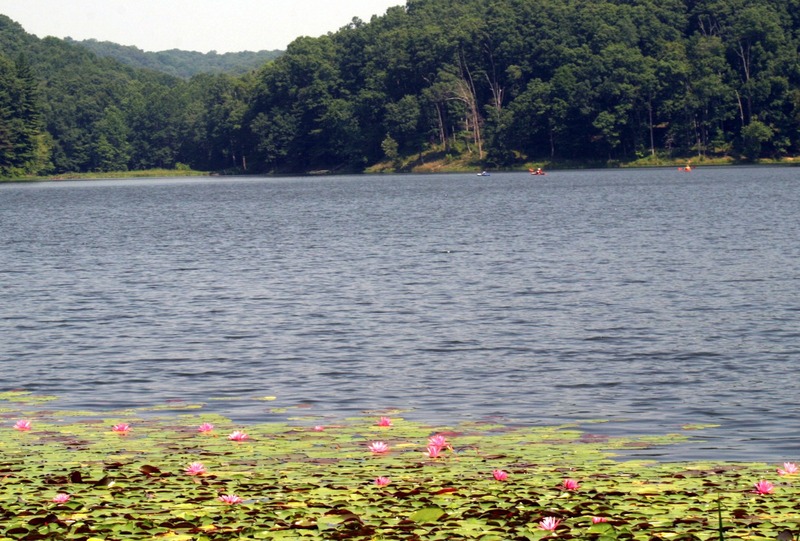 Lake Hope State Park is truly a nature lover's dream. In the forest-draped hills, the observant visitor can discover the abundant natural resources of this wild and scenic park. Although most of the forest was cut to fuel the iron smelting industry that once flourished here, the land has recovered and supports a magnificent, second-growth forest. Oak and hickory are the dominant trees while the woodland floor harbors a fascinating assemblage of shrubs and wildflowers. The yellow lady's slipper ,one of the rarest and most showy orchids, blooms in secluded hollows. Other spring wildflowers such as blue-eyed mary, bloodroot and wild geranium can be found in abundance. Deer and wild turkeys are often seen in a number of park locations. Of the many animals inhabiting the park, none is as popular as the beaver. As nature's dam builders, the beavers are found in numbers and can be observed near the quiet inlets of the lake. A fine swimming beach is located near the dam. Facilities include a bathhouse with restrooms, showers and change booths and a concession building where food and beverages can be purchased. Fifteen miles of hiking trails traverse the lake and scenic woodlands of the Lake Hope area and offer opportunities for photography and nature study. 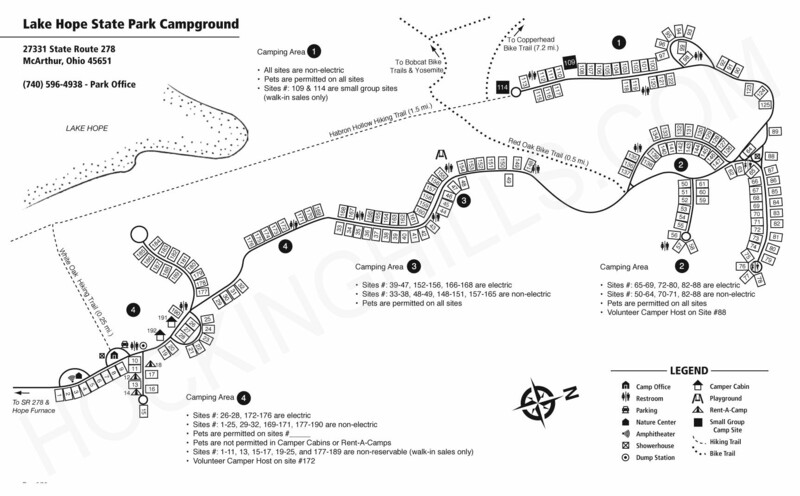 In the adjacent state forest, a 21-mile backpack trail with primitive campsites is available. Backpackers must register upon arrival. 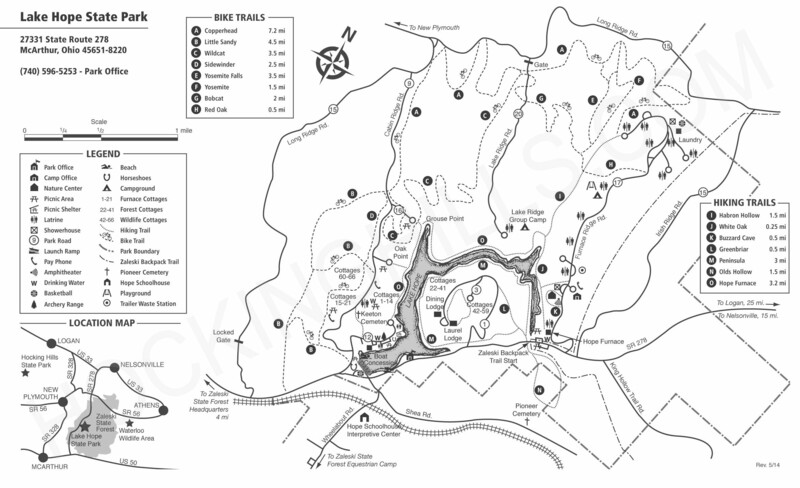 Thirty-three miles of bridle trail are available for riders with their own mounts in the state forest. 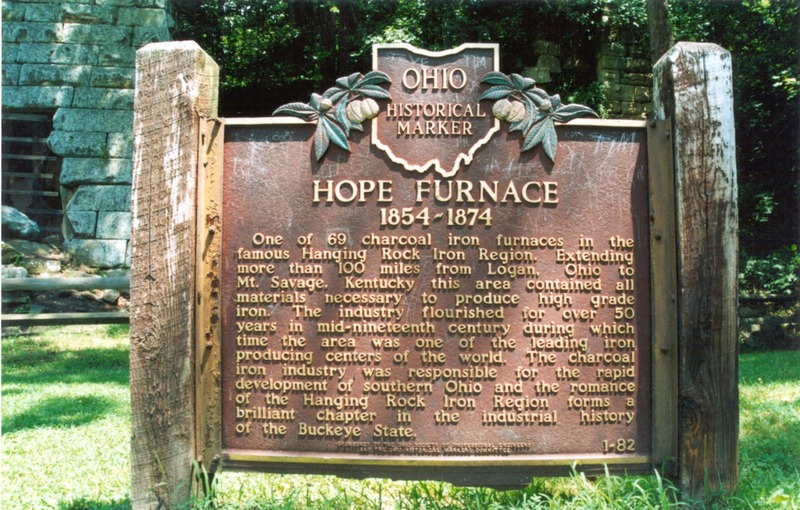 The Hope Furnace was built here over 100 years ago to process the iron ore extracted from the region's sandstone bedrock. 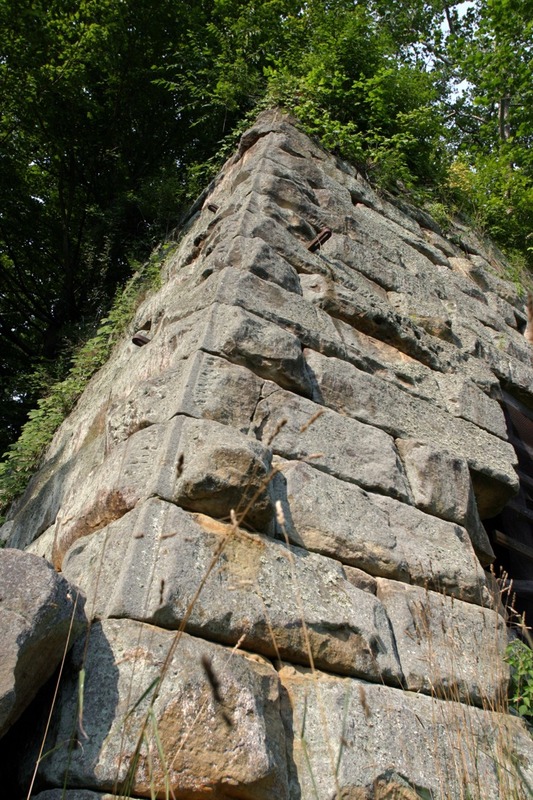 The iron resulting from the ore smelting process was used to produce many different items, including ammunition and cannon for the Union Army during the Civil War. Hundreds of men labored cutting timber, working the furnace and driving teams of mules hauling iron ore to the furnace. Charcoal fires were tended 24 hours a day; so much wood was required for this process that the surrounding hillsides were almost completely stripped of their timber. At the height of the Hope Furnace's production, Ohio was one of the nation's leading producers of iron. As time passed, iron ore was discovered farther west and Ohio's reputation as a major iron producer waned.